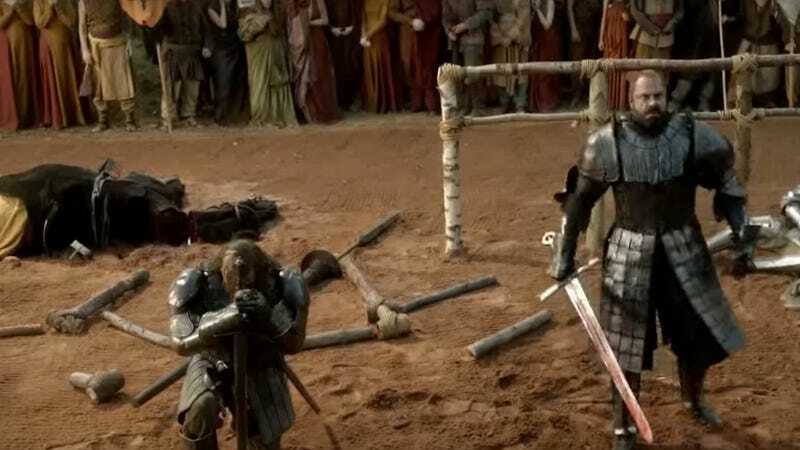 Sandor and Gregor Clegane, Game Of Thrones’ foremost Piles Of Dude, are probably going to fight to the death in the show’s final season. The brothers have sneered at and, in one notable instance, hoped to murder each other many times in the past, but now, with the conclusion of the series, there’s better reason than ever before to think we’ll soon be cheering on their deathmatch like couch-bound patricians at the HBO coliseum. Thrones fans have looked forward to this moment for years, referring to it by the dopey shorthand, “Cleganebowl.” If you’re wondering why, when there are larger-scale wars to see play out, people are so pumped to watch the brothers’ kill each other, Mashable’s Kellen Beck has provided some background summary. In short, Gregor Clegane—also known as The Mountain, because he’s, y’know, enormous—and his little bro, Sandor (The Hound), have been at each other’s throats since childhood. Most notably, the books and show detail how Gregor gave Sandor his scarred mug when they were both children: by pushing the young Hound’s face into a fire after catching him playing with one of his toys. The two have been apart for most of the story, with The Mountain having been busy terrorizing the countryside off-screen and, after one thrilling battle, being brought back to life as a red-eyed Frankenstein’s monster. The Hound, after having his own adventures—and also almost dying—is finally back in his brother’s proximity and, as a scene from the previous season showed, ready to kick off the most intense sibling rivalry since Kit Harington gained extra hair nutrients by, we must assume, eating his twin in the womb. More than anything else, “Cleganebowl” is an exciting prospect because The Hound is a great character, tortured by his own propensity for violence, figuratively reborn after serving the Lannisters and now working toward redemption. Putting him up against the monstrous brother—basically just a scowling avatar of rage—who brutalized him as a child is a fitting end to his character arc. We’ll see how this plays out when Game Of Thrones’ final season starts next Sunday.